Today the Neutron Rock Crawler by Quazar112 (InfraBlue427) also presented by its creator at EB awhile ago. It features live axle suspension, it is driven by 2 PF XL-motors and uses 2 PF M-motors for the 4WS system, with independent front and rear steering. 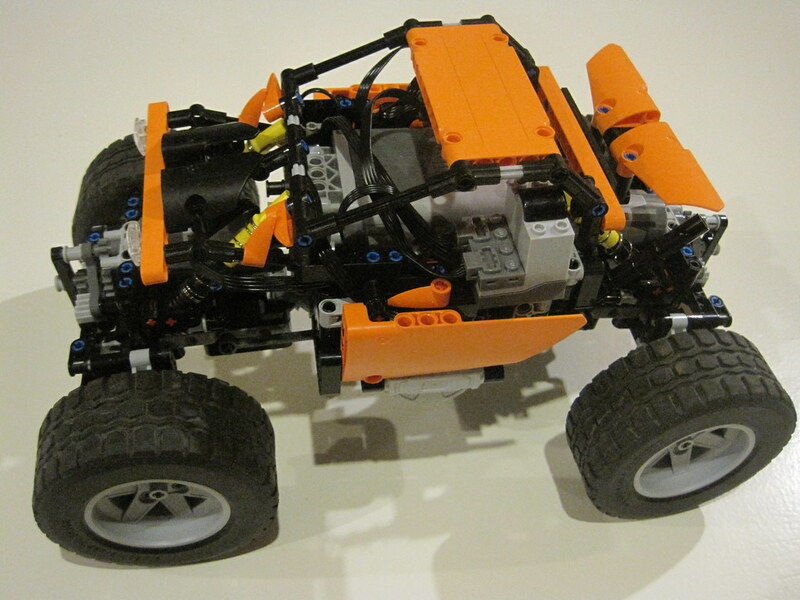 The Neutron must have plenty of power available, for such lightweight Rock Crawler powered with two PF XL-motors. Agility looks great either, because of the independent steering. Ground clearance doesn't seem the best though! No differentials have been used in both axles of this model. You may also take a look at InfraBlue427 flickr account, for the complete set of photos from the Neutron V2.0 here featured. Built it a couple of weeks ago. Has some weak spots but nothing that can't be fixed. Has a lot of power (climbs walls) but it's got a high center of gravity so it tumbles fast. It's actually called Neutron V 2.0, not Neutron V. It's the second version of Neutron, and the V stands for version. One other thing is that because it has 2 drive motors driving one axle driving 4 wheels, it stalls easily.